Metro tonight will become the new owner of Union Station, 38 acres of land around the station and the development rights associated with that land in the $75-million deal. The next step will be developing a master plan for the station. Metro will this evening assume possession of Union Station and its operation. Metro’s $75 million real estate purchase from ProLogis Logistics Services Incorporated closes today, marking a new milestone in the station’s 72-year history and paving the way for future improvements to bring Southern California’s largest public transportation hub into the 21st century. Metro’s Economic Development Department, led by Roger Moliere, has been negotiating final terms of the purchase agreement with the seller over the last eight months. The purchase turns over more than 38 acres of land and nearly six million square-feet of entitlements to Metro for future development.With the continued expansion of transit lines made possible by Measure R and anticipated arrival of high speed rail, Metro has a big job on its hands in planning future improvements. Last month, the Metro Board asked staff to develop a Master Plan for the station which takes a comprehensive look at integrating all current and planned transportation services, including pedestrian and bicycle access, at Union Station and neighboring areas. A board motion by directors Antonio Villaraigosa, Gloria Molina and Richard Katz requested that Metro planning staff create an oversight committee that would meet at least quarterly to oversee development of the master plan. Members would also include Metrolink, Amtrak, California High Speed Rail Authority, City and County of Los Angeles and Caltrans. Metro will initiate a design competition among leading real estate, planning, and architectural institutions to create conceptual designs for a “world class” inter-modal Union Station. Martha Welborne, Metro’s Executive Director of Countywide Planning, noted that the land use entitlements for the Union Station property are nearly double those of the Grand Avenue Project, a $3 billion project to revive downtown L.A, which was her previous planning post. Welborne also stated that part of the challenge will be introducing 21st century transportation technology alongside the historically-protected and venerated 1939 Union Station building. “We need a visionary plan that will also be respectful of both the historic structure and of surrounding communities,” Welborne says. To prepare for such a large-scale project, Metro has hired Cal Hollis, now chief operating officer for the Community Redevelopment Agency of the City of Los Angeles, to spearhead the Union Station Master Plan. As COO of the CRA/LA, Hollis comes with considerable real estate and economic development experience for both public agencies and private firms. Hollis has overseen seven regions including 31 active redevelopment projects within the City of L.A. He is expected to provide the heavy-duty financial analysis that will be needed to build a project with considerable financial underpinnings. That experience will be particularly useful when managing the large number of entitlement rights that come with the Union Station deal, Metro planners say. Hollis’ challenge will be in looking at all modes of mobility, from pedestrians to high speed rail, Welborne said, and evaluating how the plan would affect connections to neighboring areas such as El Pueblo, Chinatown and Little Tokyo. Hollis is expected to start in early May, and will be busy over the next two months preparing to come back in June with a roadmap for how to move forward. The roadmap will include details for an implementation plan, project schedule and funding needed to conduct the design competition and master plan. Exciting news. I’m eager to see Metro’s vision for the station’s future. Are there any immediate, visible changes that commuters and passengers can expect? Also, why will Catellus remain a party to the JMC? Do they still maintain an interest in the property? Some places or companies are bought and it is a total downfall. An example of this is AT&T and the purchase of Alltel and now T-Mobile. Sometimes things are bought and it is a new breath of hope and renewal. I feel this is going to be the case with the METRO ownership of Union Station. In the last six months there have been many improvements and upgrades in the historic station. The L.A. Metro organization continues to expand public transportation in Los Angeles where the city lagged virtually every other major city in the USA in the past. Kudos to L.A. Metro. I think you folks are doing a fine job. You are showing many folks that just because you are a large and complex organization it does not mean that good service and performance need to suffer or be substandard. Side note – I feel that your fare reduction for day passes during this time of inflated gas prices was a terrific program. Unfortunately the oil companies who are posting record profits at the expense of the consumer )when there is plenty of oil) has not followed your lead. Congratulations and a good move. As a Metro employee I can say I’m very proud, and look forward to this new venture in public transportation. If only the MTA had the same level of investment in bus lines that actually DO MOVE PEOPLE, vs. decrepit buildings that DON’T! Someone pointed out that the MTA is a STATE AGENCY! With the state being broke, would everyone be as excited if a STATE AGENCY cut investments in people, and found $75 million to invest in an antiquated rail depot? Buying Union Station will be a great investment for both Rail and Bus Riders. The improvements that this station will see are going to enhance the riding experience for tourists and regular commuters alike. Since we now own the place finally we will be able to execute a project at Union Stations without having our hands tied. Smart commuting isn’t about Bus is better than Rail or vice versa… it’s about integration of modes that supplement each other and the acquisition of Union Station will bring us one step closer. Smart investment Metro! I disagree, this wasn’t a smart invesment, it was a waste of money and it came from taxpayers money. No this was NOT a good spending and that CEO said he would reduce spending. Meto is NOT doing a good job because there has been so much mis-mangement in the past, just because a company is big organization doesn’t mean it’s that great. The only reason why it exsits is because the governorment created it which was a socialism move. If you think they are doing a good job then why is there so much mis-mangement for past years? Even big corporations are NO better at all since they are bad. I thought LA Metro was all for reduce spending but it seems they keep wasting money. Of course these people in Board are rich so they can lie, same way politicans. I still think that the money could have been saved for something else instead of buying Union Station. You’re going to find yourself alone with that position. This was a smart investment in what is the core of our region’s transportation system. With all the proposed projects lined up for Union Station, we will quickly see returns on this investment. The prior owner set many conditions and limitations to what could be done with the facility and occasionally didn’t represent what was best for the traveling public. 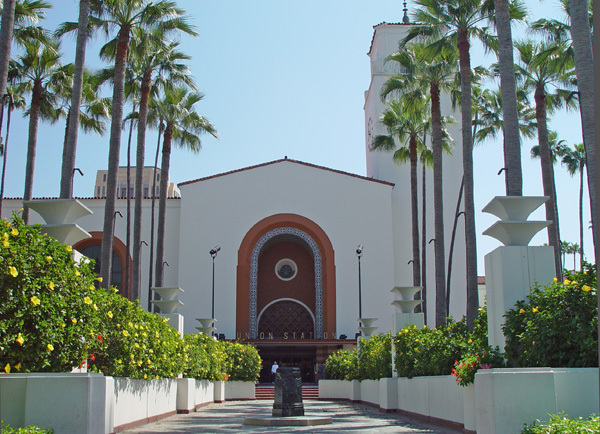 I would love to see the front parking lots facing Alameda St. transformed into pedestrian plazas that connect with Olvera St.
Having recently visited Union Station as a tourist I think it is a spectacular building and possibly an under appreciated asset for Los Angeles. I’m hoping the new owners will create more reasons for people to go there, particularly the wonderful Mary Coulter restaurant. Has anyone used the public restrooms at Union Station lately? They are a pig sty! MTA is poorly managed! Some people just don’t appreciate what they’ve got. Union Station is an architectural masterpiece, a significant piece of Los Angeles’ transportation history and it will continue to be an important part of its transit future. It’s only fair that this iconic destination should be in the hands of those who have been working to keep Union Station a vital part of Los Angeles’ transportation network. I cannot wait to see the plans for high speed rail. I think the HSR plan was useless in the first place because it was gonna fail. It would be a waste to do this HSR project. I’m going to have to weigh in on the “nay” side. Due to myriad potential conflicts of interest, I think that the less government has to do with commercial real estate, the better. Witness the Olvera Street mess. And yes, the MTA restrooms are completely filthy and disgusting. Uhh, they’ve only been Metro’s restrooms for a couple days guys. I know it’s fun to hate on Metro and all…but CLEARLY you see that they just completed the deal. Silly criticism. I’ve used the women’s restrooms there a few times and thought they were pretty clean, at least in better shape than many Greyhound station restrooms. I hope Metro can make Union Station more pedestrian-friendly and integrated into the surrounding neighborhood. I would also like to see Foothill Transit buses brought closer so people don’t have to walk so far when transferring between them and Metro Rail or buses at Patsaouras. One major point is that part of the deal is that for the first year the current maintanence company will still clean and maintain the Station; then Metro’s custodians will take over. If the restrooms are so bad, go squat outside in a bush! Geez!